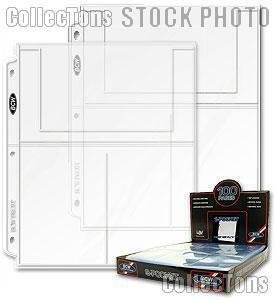 We are pleased to offer for sale these 4x6 Photo Pages 3-Pocket by BCW. This Bag of 5 Pro 3-Pocket 4x6 Photo Pages by BCW are perfect for storing, protecting, and displaying up to three 4x6 photos or postcards (4" x 6") per page. These 4x6 Photo Pages feature 3 hole punches that will fit any standard 3-ring binder. The 4x6 Photo Pages are acid free, PVC free, and made from archival quality, heavy-duty polypropylene. These 4x6 Photo Pages feature strong welds, top loading pockets, and measure 11 15/16" x 9 1/4 ". These 4x6 Photo Pages offer great protection at an incredible price for your 4x6 photos or post cards. These BCW 4x6 Photo Pages are made in the U.S.A. and are new from our inventory.